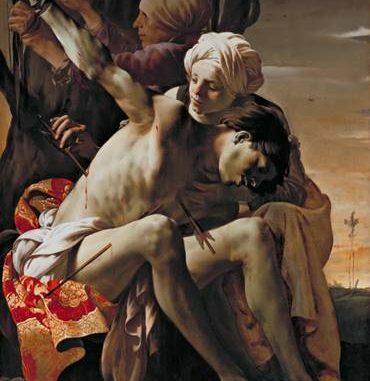 What a shock it must have been for Hendrick ter Brugghen, Gerard van Honthorst, and Dirck van Baburen, three young painters from Utrecht, when they encountered the breathtaking and unorthodox paintings of Caravaggio for the first time in Rome. Described as ‘miraculous things’, his works were marked by an innovative realism, striking drama, and mysterious lighting. He would shape the style of many artists from Italy, France, Spain, and the Netherlands. Utrecht, Caravaggio and Europe brings the Rome of 1600 to 1630 to Utrecht. Presenting seventy masterpieces, this exhibition is the first to display the Utrecht Caravaggists alongside their European counterparts: the Italian painters Caravaggio, Bartolomeo Manfredi, Cecco da Caravaggio, Giovanni Antonio Galli (Lo Spadarino), Giovanni Serodine, Orazio Borgianni and Orazio Gentileschi, the Spaniard Jusepe de Ribera, the French Nicolas Régnier, Nicolas Tournier, Simon Vouet and Valentin de Boulogne, and the Flemish Gerard Seghers and Theodoor Rombouts. The exhibition comprises over sixty loan pieces, from museum and private collections across Europe and the United States, including the Vatican Museums, the Louvre (Paris), the Galleria degli Uffizi (Florence), the National Gallery of Art of London and the National Gallery of Art of Washington DC, but also from churches in Rome. The paintings by the Utrecht Caravaggists are so recognisably Dutch, because they took Caravaggio’s realism one step further. Baburen and Ter Brugghen also painted the ugly sides of reality: monstrous noses, rotten teeth, dirty fingernails. Ter Brugghen even has the questionable honour of having painted the ugliest but also the most realistic baby in seventeenth century art. 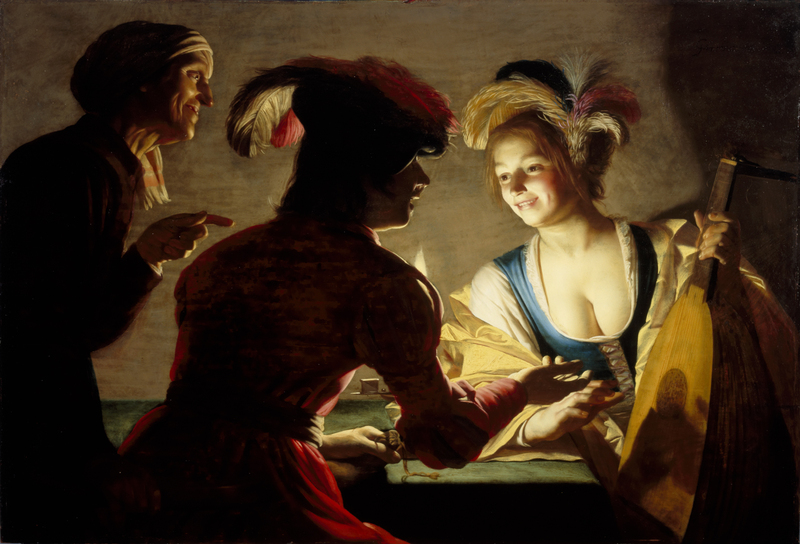 Gerard van Honthorst was very successful in Rome. Honthorst’s invention of illuminating his scenes from a hidden, indirect source of light became so famous that he was nicknamed ‘Gherardo delle Notti’: Gerard of the Nights. Just like Dirck van Baburen, he received important commissions for altar pieces, and works by both artists were purchased by important collectors such as Cardinal Giustiniani, who was also a patron of Caravaggio. Their paintings were hung in the halls of his palazzo, next to those of the Italian, Flemish, French and Spanish painters. The exhibitions follows the three Utrecht artists on their Roman adventure, demonstrates how this affected their work, and displays their most accomplished pieces. The exhibition, developed in collaboration with the Centraal Museum in Utrecht, shows over 70 of the most beautiful and important works of the leading ‘Caravaggisti’, including paintings by Bartolomeo Manfredi, Jusepe de Ribera, and Valentin de Boulogne. Placed alongside the works of their painterly colleagues, it becomes immediately apparent why the significant pictures of these Utrecht painters are so typically Dutch and had success both in Italy as well as at home. The rare loan of Caravaggio’s monumental Entombment of Christ (1602–03) from the Vatican is the highlight of this exhibition, which examines how the Italian baroque painter, along with his followers in Rome, inspired a generation of artists in Utrecht – most notably Dirck van Baburen, Hendrick ter Brugghen and Gerard van Honthorst. Find out more about ‘Utrecht, Caravaggio and Europe’ from the Centraal Museum’s website (and read Michael Prodger’s feature for Apollo here).